Art Exhibition by Gita Saraswatie. 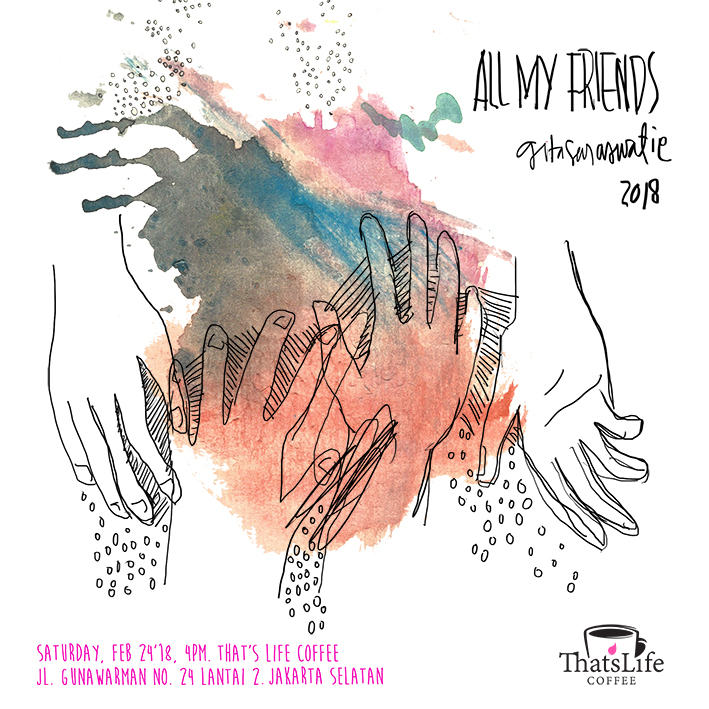 24 Feb – 25 Mar 2018 | That’s Life Coffee. An art journey that helped her through the upheaval of good and bad in life. Discover and appreciate the value of friendship. Knowing a friend is not someone that you simply know. They’re the ones that know more about you. Up and down, I always feel trapped in my own craziness. Thinking that I am not reliable and not good enough to face the day. The mood swings have always been my friend. I know that it’s not healthy to live like that. Every time I fell down, I have tendencies to hurt myself or even worse. It was quite bad. But I know that I can do much more than that, in a better way. I believe that everyone also has problems in their life. So why worry then. I like to express my bad mood by keeping myself busy and also creating something – not like I used to do before. From the stupid doodle or challenging myself to create something fun. But sure, in the beginning I hate it. Wondering why we have to be positive all the time. So I try to embrace my bad mood by doing something that I think is fun. While I don’t care whether it’s nice or not. Drawing repetitive lines, colour, some brush strokes, these are the ones that help me feel better. Then I decided to collect it. So today I can share my experience of how I embrace my bad situations. And sure, I have all the support from those people who really love me, I call them my friends. A friends is not someone that you simply know. They’re the ones that know more about you.